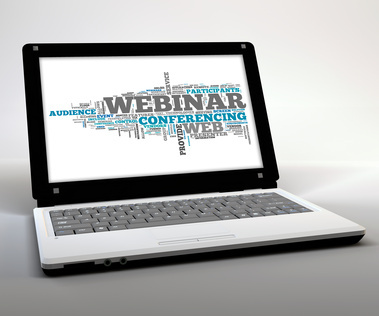 What’s the Difference Between Web Conferencing, Webinars and Webcasting? Though online meeting terms like web conferencing, webinars and webcasting are often used interchangeably, as you’ll see here, they are distinctly different online tools. Understanding their capabilities allows you to make the most of these powerful methods for reaching an audience. Web conferencing is an interactive method that replicates face-to-face meetings. All attendees of web conferences participate and have an opportunity to speak, offer visual presentations and respond throughout the meeting. A webinar is an interactive online seminar held by a presenter and attended by an audience. Webinars usually follow an agenda and provide auditory and visual access to the information being shared. Typically, the voices of those attending the webinar are muted during the presentation so that the presenter’s message comes across clearly, and then he or she may invite live questions at the end. Webinars are especially powerful marketing tools that allow businesses to make announcements about new products or services, and they are often used as training tools for the introduction of procedures and policies. Paula Wilson owns an insurance agency specializing in employee benefits and is considered a national expert on healthcare reform. She often uses webinars to relay information of importance to her clients. “Webinars are an effective tool for getting across important information in the ever-changing world of healthcare, and they allow me to keep my customers informed of the many changes affecting their businesses,” she says. Webcasts are essentially one-way Internet broadcasts that involve no interaction on the part of the presenters and viewers. Such presentations are often pre-recorded and put up on the Internet for people to view at their convenience. While they may be somewhat time-sensitive, webcasts often don’t require that those who watch them sign on at a specific time. They can be kept up on the Internet as long as a webcaster deems necessary. Businesses use webcasts for a wide variety of reasons, including CEO “State-of-the-Union” addresses, earnings announcements, training and educational materials and marketing promotions. Television and radio stations webcast extensively to impart news and information on the Internet, sometimes streaming live content. Now that you understand the capabilities and limitations of the different types of online meetings, you can choose the best method to meet your business goals. With the webinar tool would I be able to mute and unmute audience members at will? what is difference between online collaboration and web conference?